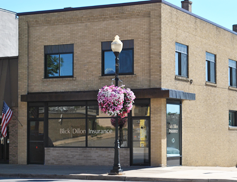 Blick Dillon Insurance has been offering insurance protection at affordable premiums for over 100 years in the greater Cadillac area. With more than 200 years of combined professional insurance experience, our licensed agents guarantee that our clients receive top-quality service. Since Blick Dillon Insurance is an independent agency, we offer choices in companies, value for your money, and outstanding service to protect your home, family, and business. There is a difference when it comes to buying your protection. That difference is Blick Dillon Insurance!